In the throes of mania or depression, a person may not be thinking clearly enough to seek treatment and may even refuse necessary treatment. Loved ones want to do what’s best, but they often hesitate, not knowing when to step in and what to do. Should they call your doctor or therapist or drive you to the nearest emergency room? Should they take away your car keys if you’re driving erratically? Should they take away your credit cards and freeze your bank accounts if you seem to be unable to control yourself? To take some of the guesswork out of making these important and difficult decisions, create and sign a bipolar disorder treatment contract. You can download and print this Sample Treatment Contract PDF and use it as is or use it as an example to create your own personalized treatment contract. 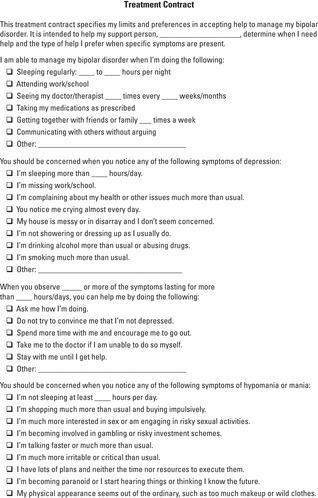 Complete and sign the Treatment Contract and give a copy of it to the person you choose to place in charge of making your treatment decisions when you’re incapable of doing so.